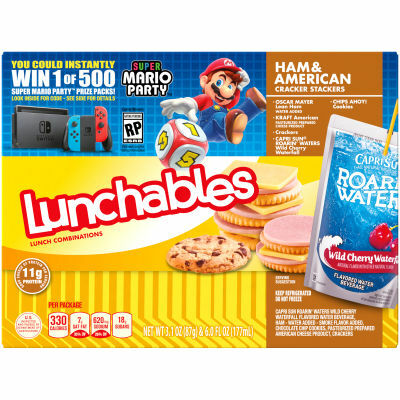 Lunchables Ham & American Cracker Stackers helps fill them up with what they want. Made with Oscar Mayer Lean Ham, Kraft American and crackers. Includes Capri Sun® Roarin' Waters and CHIPS AHOY! cookies. A delicious, convenient, and fun option for school, picnics, or on-the-go lunch. Good source of Protein. Each box is 330 calories.